The Honda immobiliser system like so many other vehicles can have problems. The most common time for a Honda to suffer an immobiliser problem or malfunction is when either the car has a weak car battery, the car has been jump started, or the car battery has been flat. Modern cars have a number of computers including the immobiliser and the engine control unit, the biggest cause of malfunction is a spike of voltage, this is why when jump starting any modern car you must take real care, as it will cause damage. Most cars have a "tell tail" immobiliser light and Honda is no exception, this light is a good pointer for immobiliser malfunction. 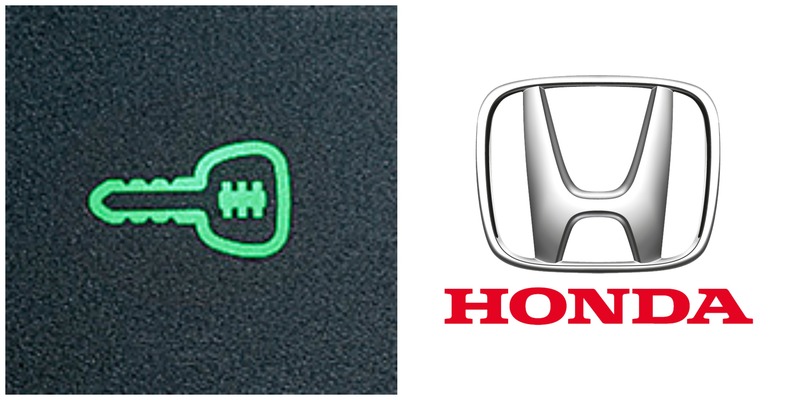 It is a green light in the shape of a key on a Honda and is located in the instrument cluster. Once you have found the immobiliser light you should observe what it does when you turn the ignition on. When the Honda immobiliser system has a problem this light will flash after the ignition is turned on. Normally the car will crank over but it will not start, however this is not always the case. Can we fix Honda immobiliser problems ? YES .... at Replacement Car Key we have an in depth knowledge of vehicle immobiliser systems along with the equipment including specialist computers to diagnose, and repair immobilisers. We also have the ability to test vehicle computers and immobiliser units, along with car keys (the main dealer cannot do this) this means we will find the problem and fix it. Call us and we can solve your immobiliser problem, we cover all makes and models. we have a range of tools and computers to program car keys including dealer diagnostic tools, these tools enable us to connect to the car via its diagnostic socket and program keys to any vehicle. We also have specialist immobiliser equipment that enables us to go direct to the immobiliser unit and read or change the data contained within it. Immobiliser Problems and faults, Smart cars like most cars can suffer immobiliser problems, on the early smart cars like the 450 chassis the remote key operates the immobiliser by the button being pressed, the later smart cars the 451 chassis have a transponder (an electronic chip) inside the key. The Honda immobiliser system like so many other vehicles can have a malfunction or problem. the most common time to suffer an immobiliser problem is when either the car has a weak car battery, the car has been jump started, or the car battery has been flat. Renault immobiliser systems have their fair share of Malfunctions and faults, These can range from damaged or faulty keys, control units, through to problems in the wiring loom. An immobiliser is an anti theft device which makes it difficult for a would be car thief to steal your car. In simple terms the device will either prohibit the starter motor from working, or cut the fuel to the cars engine.